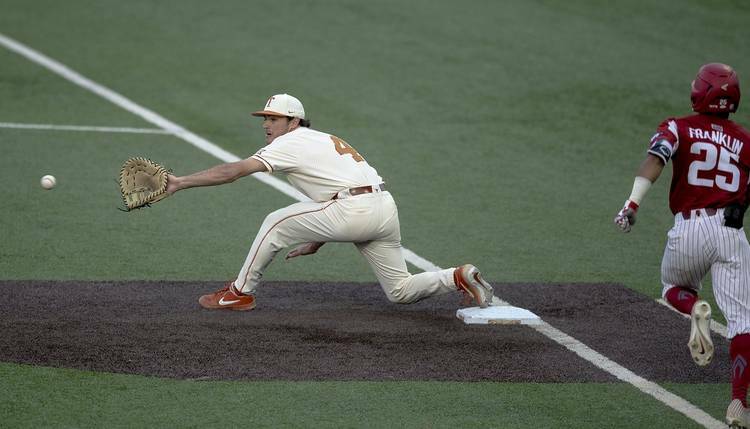 Texas fell into an early hole during a wild game at UFCU Disch-Falk Field on Wednesday, but the Longhorns rallied and earned a split of a midweek series with Arkansas. One day after it scored six times in the second inning of an 11-4 win, Arkansas struck again with four runs in Wednesday’s second session. 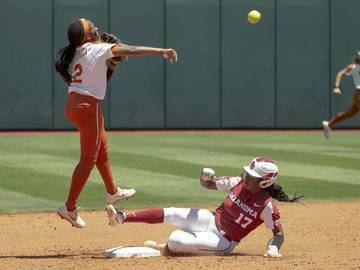 After cutting Arkansas’ lead in half during the third frame, Texas outscored the Razorbacks 2-1 over the next two innings. In the sixth inning, Zach Zubia tied the game with a two-out single. After UT loaded the bases, the Longhorns gained control of the scoreboard when Tate Shaw drew a walk and Michael McCann was hit by a pitch. With two outs in the ninth inning, Arkansas doubled home a Razorback to pull within one run. 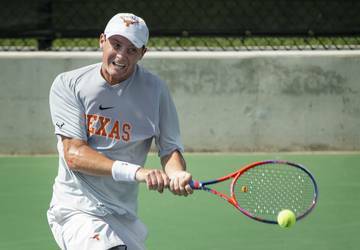 Texas’ Cole Quintanilla, however, struck out pinch-hitter Matt Goodheart to end the game. Between the two teams, 15 pitchers were used on Wednesday night. Fifteen hits were produced in the 13-run game. Additionally, 374 pitches were thrown, 18 walks were issued and eight batters were hit by pitches. 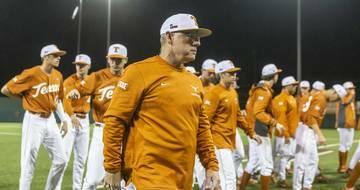 Ranked ninth by D1Baseball, Texas (16-8) will now turn its attention to its upcoming series at No. 22 TCU. The No. 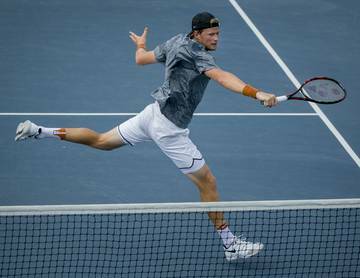 11 Razorbacks (18-3) will head to Alabama this weekend. Great catch and classy move from a visiting Arkansas fan. One-handed snag then hands the ball to a young @TexasBaseball fan. NOTABLE NUMBER: 5. 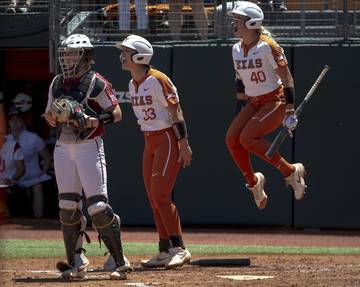 A throwing error by shortstop Masen Hibbeler scored Arkansas’ fourth run and was also the Longhorns’ first defensive miscue since a loss at Stanford on March 10. 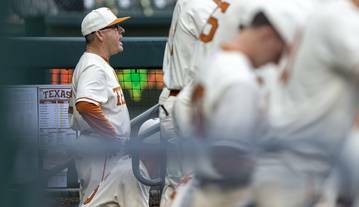 Texas last went five games without an error during a seven-game stretch in 2017. 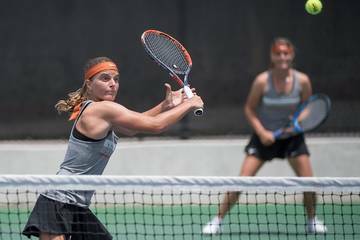 Texas entered Wednesday’s game with a .963 fielding percentage that ranked 186th among the NCAA’s Division I defenses. On the day following the aforementioned Stanford game, there were 249 teams with a better fielding percentage than UT’s .954 mark. 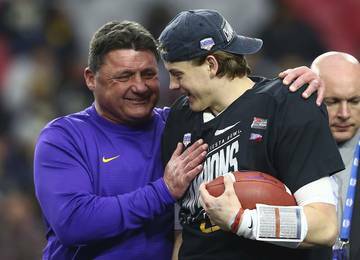 UP NEXT: Texas swept TCU last year. 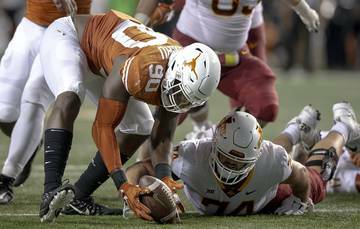 The Longhorns, though, last claimed a series in Fort Worth in 1992. The Horned Frogs (13-6) haven’t played a Big 12 team this season while Texas won two of the three games in last week’s conference-opening series against Texas Tech.